A round trampoline that is under 10 feet in diameter is perfect for someone with a smaller backyard area. If you decide to go with this trampoline size, then it’s important to understand some of the limitations. While our trampoline safety tips suggest limiting the number of jumpers to one, we know that rule will always get broken. That said, the eight to ten foot round trampolines are not meant to support more than one jumper. If you have one kid or have the discipline to enforce the one jumper rule, then this size trampoline will be a great addition to your backyard. Remember that owning a trampoline of any size beats not having one at all. Expect most trampolines in this size group to cost around $200 (depending on the brand). Again, the first consideration will always be the size of your backyard. It’s a little bigger than the eight to ten footers but is still smaller than the bigger sized trampolines. Most people would call this a medium sized trampoline. If you decide to break the one jumper at a time rule, then only do so with smaller kids. For example, having two larger teenagers jumping on a 12 foot trampoline would be risky; it may break. Most 12 foot trampolines will cost around $300 (depending on the brand). Okay, now we’re in the “big” trampoline territory. A bigger trampoline gives you a lot more flexibility but will always come with the highest price tag. You’ll need to have a big backyard to support one of these. Also, if your kids are social, then expect to be hosting a ton of friends; your house is going to be the hit of the street. While it’s not often mentioned, the bigger trampolines are safer than, the smaller ones (assumes you follow good safety rules). That’s because the bigger trampoline gives the jumper a larger landing area. There is less chance of landing on the springs, frame, or falling off it altogether. The great news is that large round trampolines are ideal for most age groups and give you the most potential return on your trampoline investment. Kids under ten will still get a solid bounce, so there’s no need to worry that they are too small/light for it. The larger trampoline size will cost around $400 (depends on brand). Rectangular trampolines require the same thought process when it comes to your backyard size: If it’s too big then don’t buy it. But, rectangular trampolines are different when it comes to age and weight considerations. The rectangular trampoline has a firmer bounce than its round counterpart. It makes it a less favorable option for the little kids; it’s tough for them to get a solid bounce. If you’re considering the Olympic size trampoline, then we recommend it for kids over the age of nine. If your kids are younger, then they may not get a great bounce. The Olympic sized trampoline will cost around $600 (depends on the brand). What If My Kids Are Younger? 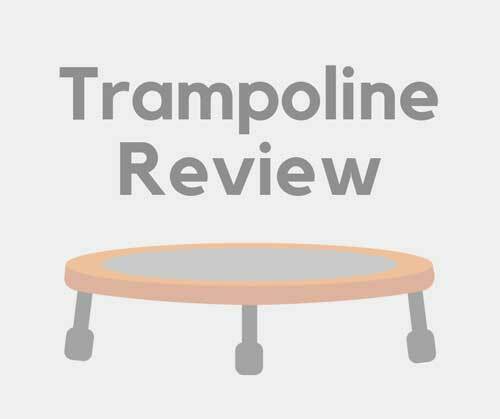 If your kid is younger than age six, we recommend checking out the mini trampolines for kids. There are a ton of brands that offer indoor and outdoor options. The mini trampoline is a perfect gateway into the trampoline world. Choosing the right trampoline size requires more than one factor of consideration. First, make sure the trampoline will be able to fit in your respective backyard. Second, you must assess how many jumpers will be on it. If you have one kid, your decision will likely be much different than someone with four or more kids. Also, make sure to consider your kid(s) friends coming over. Third, how old are your kids and what’s the plan for the trampoline? If you want something to last more than a few years, you’re better off going with a larger round trampoline (assuming you have the size). Remember, owning a small trampoline is better than not owning one at all! What Are Trampolines Made Of?